Spooner Row Church was built as a school in 1843. 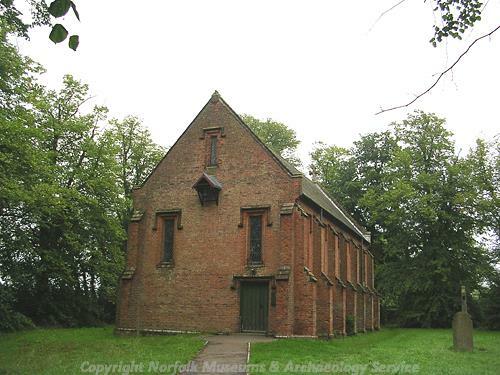 It stands on the junction of School Road and Chapel Road, and is of brick and slate with a nave and sanctuary. It is thought that this may also have been the site of the Holy Trinity Guildhall. Built as a school in 1843. Listed building description (S1) adds: By John Buckler. Brick and slate, nave and sanctuary. Six bays north and south between buttresses, windows are lancets under square hoods. West hall below two lancets with third in gable. Reference (S2) states this stands on the site of Holy Trinity Guildhall. E. Rose (NLA), 8 April 1997. Architect's plans 1999, see (S3) in file. However, (S4) states that there is no evidence for John Buckler being the architect. The church now has the bell from Silfield Church, which is the only bell ever made by G. Day and Co. of Eye in 1915. For further information see (S5). A. Cattermole (HES), 1 February 2011. <S2> Article in serial: Barnhall, K. 1996. The Religious Guilds of Wymondham, c 1470-1550. Norfolk Archaeology. Vol XLII Pt III pp 321-331. <S4> Publication: Cattermole, P.. 2007. Wymondham Abbey. P 161-2. pp 161-2. <S5> Unpublished document: UEA Schools Survey. 2009. Norfolk Rural Schools Survey Form. Spooner Row..